Three plants come to mind when people talk about a plant going out of control. The first one is bamboo which really depends on the variety of bamboo and who you ask. Some people claim you can just kick over the new sprouts when you see them and it keeps it in check. I don't think I want to find out the hard way. 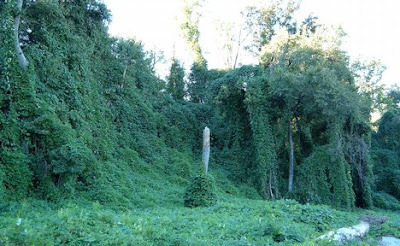 The second is kudzu. A very green and fast growing vine that has taken over many highways in Louisiana and is listed as an invasive plant in many of the southern states. It just doesn't get cold enough to keep it in check. Asian jasmine though has to make the list as well. Although easy enough to pull up and get out of the pond when it creeps in, it's hard to get rid of every root if you are trying to get rid of it completely. It will come back with only one root and fill a bed in a season if you let it. Of these I only grow a little bamboo in a pot since it won't try climbing over the edge and trail across the yard or up a tree or through the holes in my fence. Well, the onion was sewn back in January and has been growing very nicely for over a month now. I have some lettuce seed, dill seed, carrot seed, beet seed and some old heriloom squash seeds that need to be planted. I should probably clean up the back yard a bit before planting so I can make sure I have plenty of sun for all of it. Also coming in the mail are the hops rhizomes which I plan to plant near the drive along with some lavender bushes. The fig tree has already put on green tips. AMybe it knows something the rest of us don't. Short winter maybe? We can only hope for a long cool growing season. We tried to make some herbal honey yesterday. Although the quantities might be off a little it seemed to go pretty well. I ran a quick batch with about as much rosemary as there was honey and let it sit for a minute and then strained out the rosemary and added it to some of the yogurt I had made last week. It took a while for the honey to drip through the little strainer but I wan't in any hurry. We were a little worried about the rosemary after the long freeze since some of it had turned color a little but it all seems fine. Some parts are just nicer looking that others for now. I really need to do some major pruning on it anyway. I want to see if I can get it taller and not quite as bushy. We're looking in to making soap and I was curious about what we could put in it that we already had growing around the house. come to find out there is quite a bit that can be used in making soap. Most of them unfortunately need the oil extracted out of them. For instance, lavendar and rose will need to have their essence extracted using enfleurage or extracting into a carrier oil. The rosemary and lemongrass on the other hand can be distilled and the oil trapped and stored. A couple of the other plants are yarrow and aloe which can be added without these processes. It will still be some time before we attempt our first batch but we have plenty of help. I didn't follow any of the online guides on planting the seeds. I used the old fashion way of just putting it in the dirt and adding water. The online resources were right about germination time though, about two and a half months. The first one is plain to see. The second one is about and inch and a half to the left and can be seen better in the blow up by clicking on the picture. This is probably just your standard Arabica coffee but it's in my house! Coffee is an ideal houseplant and can easily be kept pruned back to about any size you like from a full size floor plant to a medium size table plant. Too much smaller and the tree might start to suffer not to mention look funny. A bare spot is a terrible thing to have in a garden. The local strays have put it there and don't get the hint when I run them off. When I pruned my lemon tree it gave me a great resource to take care of the problem. Someone tole me once that you should put a lattice of sticks across bare spots like this to deter the cats. I figured a few thorns would be an added bonus. My lemon tree has thorns that are over two inches long. Some of them I pushed into the ground to keep the trimmings in place and some are sticking up to make a very uncomfortable bed. So far they have stopped sleeping there. One of the easiest things to grow is aloe. In southeast Texas I helped water my great uncle in law's aloe green house. All he had in it was aloe since he used it for his stomach. Quite a few of the plante even flowered while I was staying there for the few short months. If you know someone who has it, all you need is a little starter plant and it will spread to fill the pot usually within a year. As I mentioned, it's good for stomachs but it's also good for burns and cuts. A little aloe spread on a leaf of lamb's ear and you have a great bandage. It can also be used to keep skin looking young after a bath. It's apparently also very easy to kill aloe. All you need to do is leave it outside when it freezes for a few days and it all turns brown and dies... Fortunately I know quite a few people who have some and who are more than happy to share. My wife got into her head that I needed to make and sample different lemonades made from fresh lemons simply because she was making popcorn. I still don't get it but it was a bit of fun anyway. I can't say it was very extensive or entirely lemons but here's what we found out. First, you need to make sure you have enough lemon juice and enough sugar in any lemonade you want to make. Too little of either and you don't have much of a drink and the popcorn gets cold as people wait for their drinks. Second, Meyer lemons are much more mellow and lack the bite that your average lemon has. Third, a bergamot orange is not a good substitute for lemons... I should have known. It does however add a very floral note to the drink if added to lemonade in small amounts. There was an article in the paper today about what it takes to run a plant nursery. The guy interviewed said that he likes to carry a few new and interesting plants but in the end he has to rely on his top 40 money makers. That got me to wondering what the top 40 were. I couldn't get up to 40 but here's my guess at a few of them. Remember I live in Texas. I couldn't figure out what was being mixed to make a loquat so I looked it up. Come to find out that nothing is mixed. It's not even a citrus fruit. Like the kumquat the ending "quat" is a descriptive chinese reference to it's resemblance to an orange. An interesting note on citrus seeds is that they can and often do produce true to the fruit. One reason for this is that many of them can be pollinated by themselves. Without the need for another tree the seeds have no genetic pollutants. This is not the case for all citrus however and in these cases you would need two of the same type of citrus growing near each other to increase the chance that the trees grow true to the fruit. I have successfully grown key limes, kaffir limes, and lemon from seed and they have all grown true as far as I can tell. One reason for this is that orchards usually clump all of one type of citrus together. It would kill production to have them scattered. I don't know if the kumquats will produce true since the tree had two different orange trees planted right next to it. It might be interesting to see what comes up. My wife pointed out today that I come by my green thumb honestly. Both of my grandparents have kept gardens for extended periods of their lives and my mom nearly farms on her land. It's no wonder then that I like to grow whatever I can. Today I visited my grandfather on my father's side and had a wonderful time picking sweet oranges and kumquats. If you haven't already guessed it, I'm going to plant as many kumquat seeds as I can pick out of the fruit. So far that amounts to 3 and I've only eaten one kumquat! I have left the lemon tree out in the weather this year, possible the worst year in a very long time. If it survives this I will have no worry about planting it anywhere around the house. It's been frozen to the point that if it was going to die it would. When everything else had snow and ice on it, the lemon tree didn't have any. I figure it has to do something about the oils in the leaves repelling water. Earlier today the leaves were still green and just a little curled.